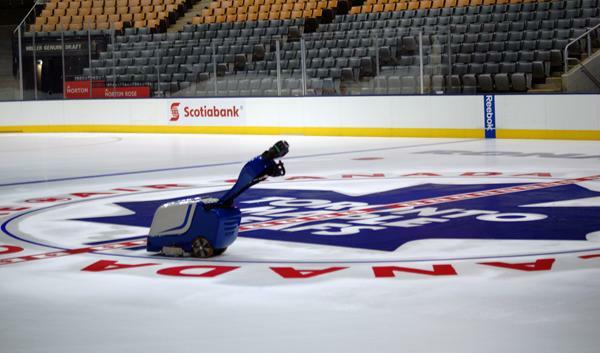 The ICE Crew at the ACC is making great strides with their “Team Up Green” initiative started in 2009. The ACC is reducing its carbon footprint, minimizing environmental impact, reducing energy consumption, and increasing waste diversion. With the help from Joe Johnson Equipment (JJE) and the Minengo Ice Edger, the ACC has taken yet another step towards meeting its goals. In January 2013, the ACC began using the Minengo Edger because it met with the ACC’s “Team Up Green” initiatives in a number of ways. The Minengo Edger not only emits zero emissions – emissions that would normally be exposed to spectators, players, and employees with a traditional edger – but also eliminates the need for fuel because of the powerful electric motor and maintenance-free batteries. In addition to eliminating emissions, the Minengo will also reduce the ACC’s carbon footprint and facility costs.